Thursday, November 9, 2017 at 3:24 p.m.
It’s an in-your-face approach to stopping domestic violence in Spokane. 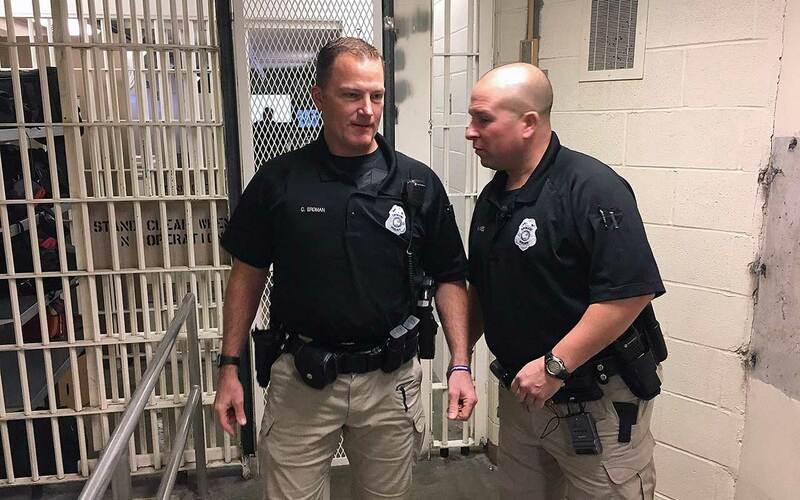 Aaron Ames and his partner make regular trips inside our jail to let suspects, who’ve just been arrested on DV charges, know they are now on the officers’ radar. “So we’re checking jail phone calls, we’re going and contacting victims. We’re checking to make sure the no–contact orders are being adhered to,” Ames explains to a recent arrestee. After 18 years as a graveyard patrol officer, Ames has joined Spokane’s Regional Domestic Violence Unit. So instead of responding to DV calls in the middle of the night, Ames is trying to prevent them. “I wanted to get out and help the community and hopefully put some bad guys in jail and help some people who may not necessarily be able to help themselves,” Ames said. Ames and officer Chan Erdman spend a lot of time in the field making sure DV victims know the police department and prosecutors have their back. “So we’re just following up on some arrests made in the past couple of weeks. Following up with the victims. Just making sure everything is o-k and if they have any other questions and make sure they are not being harassed,” Ames said as the pair cruised Spokane in their plain-wrap patrol car. But victims of domestic violence, people going through great upheavals in their lives, can be hard to find. So Ames’ new assignment involves a lot of door knocking and phone tag. “I still love him; I want to work things out. I want to give him a second chance,” said a woman who answered the door at her downtown apartment. Sometimes DV victims want to salvage their relationships but others find themselves struggling to escape. Ames and Erdman are called to an East Central Spokane home by a single parent mom who says her allegedly abusive boyfriend is still trying to control her every move. “He’s been arrested twice this month for an order violation but she claims she’s been getting bad pressure from his mother to drop the order,” explains Ames after looking at the case file on the computer in his patrol car. Ames works to win the woman’s confidence and promises YWCA advocates will help strengthen the no contact order.